How is 2014 treating everyone? We are off to a good start and hoping tonight when Auburn (cross our fingers) beats Florida State tonight in the National Championship game it will be even better! Regardless it’s always great to be an Auburn tiger! 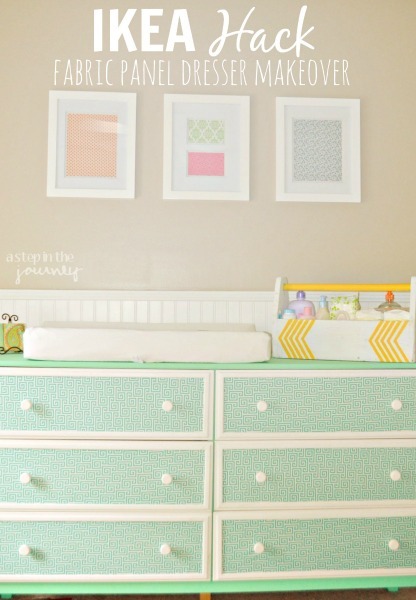 I still have several projects from 2013 I want to share with you, starting with this IKEA hack dresser makeover for little chickadee’s nursery. So as simply as possible let me tell you how this happened. This piece would look beautiful stained with some fun hand painted knobs (which you could probably find on sale at Hobby Lobby). But I had a different idea in mind. 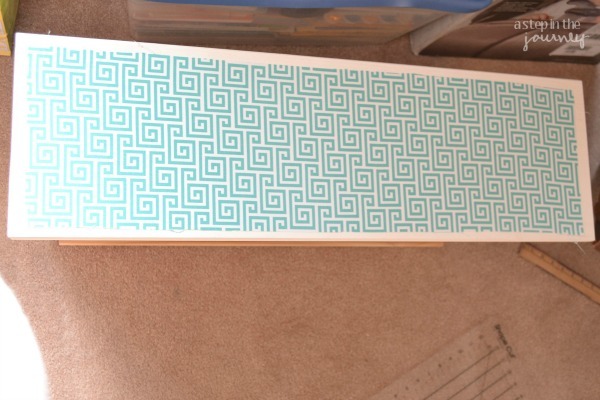 I started by priming and painting the dresser (minus drawer fronts) a teal/mint/green color. It’s Behr from Home Depot but I don’t remember the exact name, I can find out if you would like to know. The drawers got a crisp coat of white paint. Next I cut out the fabric (from Hobby Lobby) in a rectangle two inches smaller in length and width than the drawer fronts. I attached the fabric in the center of the drawer using a spray adhesive made by Krylon. 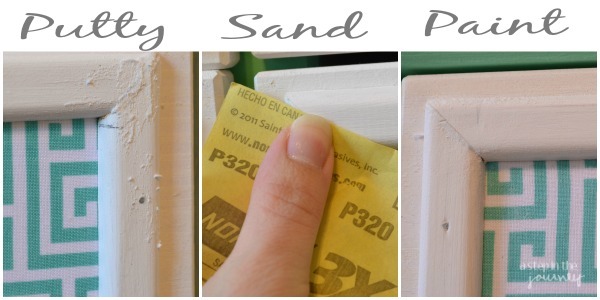 I picked up general purpose screen moulding and 5/8″ wire brads at Home Depot as well to add a little dimension to the drawer fronts. I painted all of the moulding white before I started cutting. After measuring the length I needed each piece I used a miter box and hand saw to cut each piece at a 45 degree angle. I attached the moulding to the drawer fronts using the 5/8″ brads, every 6 inches or so. 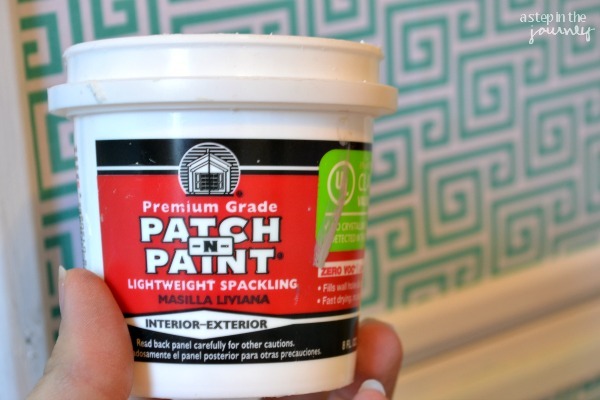 Then I used this patch and paint to fill in the corners and nail holes. After another coat of paint on the trim all that was left was attaching the knobs! I absolutely LOVE how the dresser turned out. One of a kind, you might say! The dresser is a little bigger than I thought it would be, but every drawer is filled to the brim, so I’m glad we went with this six drawer size. Love it, love it, and love it some more! Great job, thanks for posting! 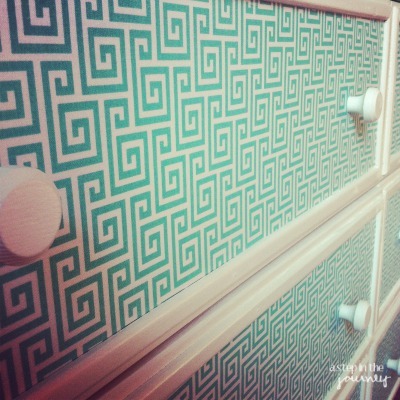 Love what you did with the Tarva Dressers – so pretty! I just gave one a makeover as well to use as a change table for my daughter. It’s the perfect size dresser for one isn’t it? Yours caught my eye at the From Dream To Reality Party. 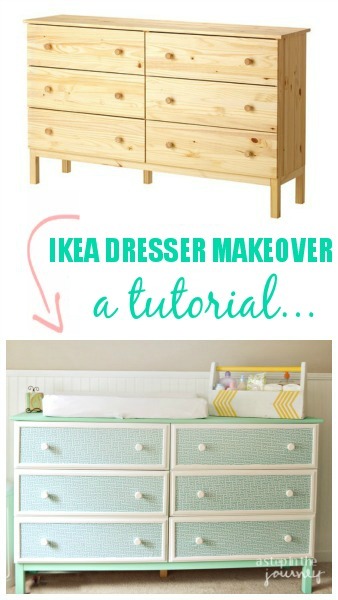 It works perfectly for a dresser/changing table! This dresser turned out gorgeous! We would love for you to share this at the Awesome Things Tuesday Link Party here:http://artzycreations.com/awesome-things-tuesday-65/ Have a great day! This is SO stinking adorable! I absolutely love the colors! I just did a Tarva for my daughter’s room. 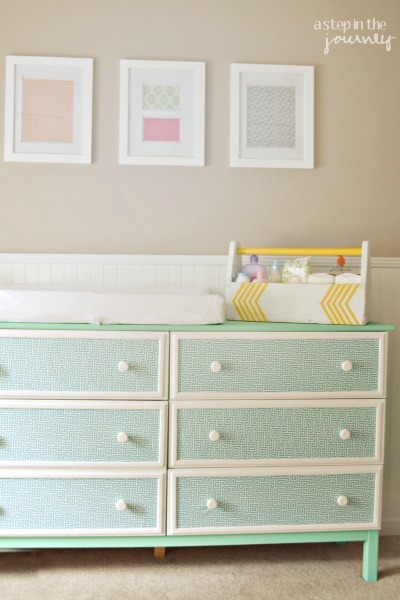 I wish she had let me be this creative…all she wanted was a white dresser with teal pulls. Yours turned out fantastic!!! This is such a beautiful Hack…..your colour choices are stunning! Probably the best hack I have seen! You are soooo sweet! Thank you so much! Great makeover! Thanks for the inspiration! I so glad you are along for the journey Nicole! Congrats on your baby girl…..having Chickadee what a life changer in the BEST possible way! The Ikea Tarva dresser is a little bigger I think than I thought it would be, but we have so much stuff and had no problem filling it up! The changing pad does hang over the back very slightly, but it has not been a problem for us. We have the changing pad from Babies R Us. I think it is the Summer Infant brand. Good luck with the dresser. I’d love to know how it turns out! Love, love, love this!! How much fabric did you use for this project? I’m thinking about doing the same thing in our nursery. Thanks for sharing you idea! this is seriously, offing amazing! sharing on FB and pinning! What an amazing transformation!!! I just love everything in the final picture, the colors, the dresser, the art, the basket. You rock! Looks awesome! I love the colors and fabric you chose! I love how this turned out! Very creative and PERFECT for your little misses room! Ooooh, your dresser is just beautiful! Thank you so much for such wonderful and clear pictorial directions. I am one of those people who is afraid to fail so I don’t get started, but posts like yours give me confidence! 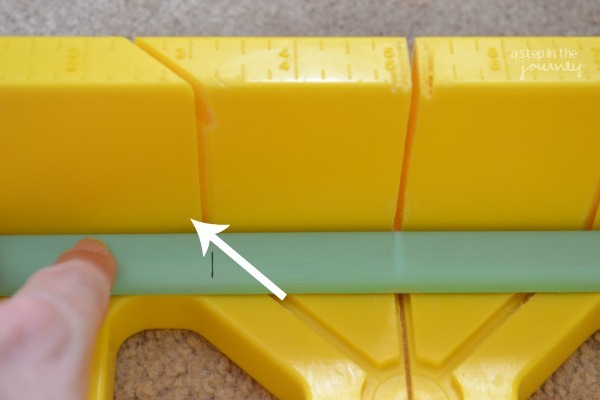 Who knew there was a miter thingy like that?!! You nailed it about IKEA…I call what I buy “a box of parts”…bless your sister for being such a great help! Congrats to Auburn for making it to the National Championship! Looks so sweet and pretty! I’m getting ready to use fabric on a dresser in our guest room/ nursery too! Love how yours looks! Love the colors! So sweet!